Average True Range is a volatility indicator from J. Welles Wilder that measures commitment by comparing the range for each successive day. Expanding and contracting ranges signal eagerness in a trending market. Details of the formula can be found at Average True Range Formula. Please note that Wilder does not use the standard moving average formula and the time period may need adjustment. Low values indicate ranging markets. Microsoft Corporation with 14 day exponential moving average of Average True Range. Mouse over chart captions to display trading signals. 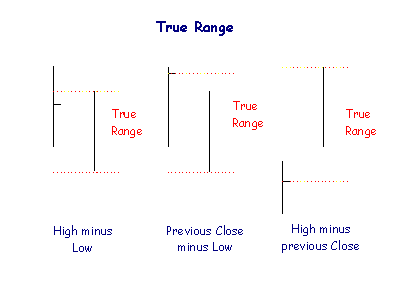 The Average True Range indicator peaks before price bottoms. Low Average True Range readings - the market is ranging. Average True Range peaks before the market top. Average True Range peaks after a secondary rally. Average True Range peaks during the early stages of a major price fall. 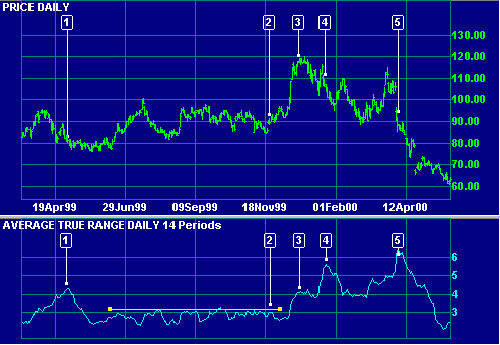 The default Average True Range indicator window is 14 days. To alter the default settings - Edit Indicator Settings. See Indicator Panel for directions on how to set up an indicator. Learn how to manage your market risk. gold, crude oil and forex. on Trading and the Economy, as well as new software updates. High for the period less the Low for the period. High for the period less the Close for the previous period. Close for the previous period and the Low for the current period. Basically, the Close for the previous period is substituted for the current Low, if lower, or for the current High, if higher. Average True Range is typically a 14 day exponential moving average* of True Range. Many investors follow active strategies but end up being reactive, rotating in and out of stocks at the wrong time. 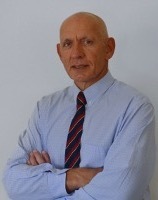 Manage risk and improve your market timing with Colin Twiggs' weekly review of macro-economic and technical indicators. Join our free Trading Diary mailing list with > 140,000 subscribers. © Copyright 2001 - 2019 Incredible Charts Pty Ltd. All rights reserved.